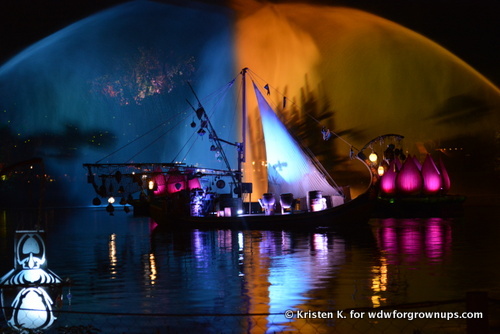 Rivers of Light takes place on the Discovery River, which surrounds the Park's Discover Island. It's a brilliant use of the waterway that was otherwise unused in the Park. The evening entertainment can be viewed from stadium style seating for 5,000 with entryways both in Asia and Dinoland. It's difficult to get a bad seat for this show. My daughter and I enjoyed using the time before the show to rest, have a snack, and watch the last rays of sun disappear behind the Tree of Life. 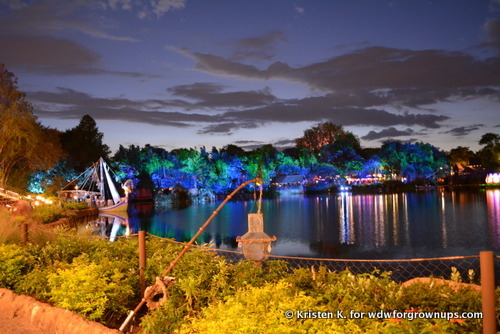 During the pre-show time four large loutus floats move into place, animals can be seen and heard moving through the trees, thousands of fireflies dance amongst the greenery. The fireflies accent a central motif in the show, the migration of light. 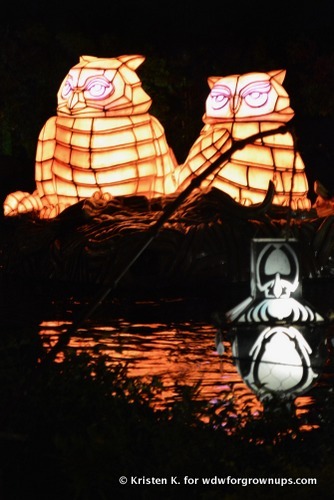 The floating sets of Rivers of Life evoke traditional Asian lantern festivals. Lanterns symbolize the people letting go of their past selves and getting new ones. 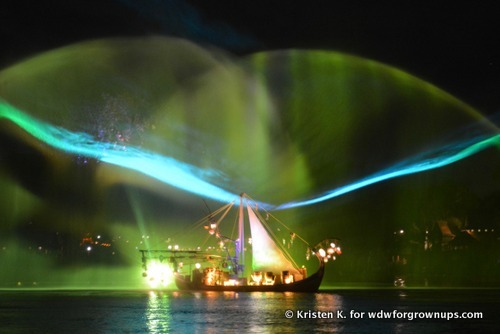 As one watching Rivers of Light and listens to the story it's easy to let go of a connection to modern technology and craziness and focus on connecting with the natural world. Guests are introduced to luminous animal figures moving on the water Owl, tiger, turtle, and elephant totems represent the animal world. Through the magic of twilight they morph into spirit. Of all the gleaming planets in our vast universe, it is only here on Earth that water and light harmoniously unite to create the wonder of life. We most graciously welcome you to a timeless celebration of water and light with roots as far reaching as time itself. Here, where the forces of nature meet in harmony, the spirits of the animals are free to dance together in the night sky creating Rivers of Light. We are united in this special place to celebrate the magnificence and wonder of all living creatures, for in life we are all one. One by one the spirit animals take to the sky, and the loutus move into place for a graceful dance of a fountain ballet. The original song "We Are One" provides the moving soundtrack to this portion, while footage taken from popular Disneynature documentaries move us across the planet through dense jungles, ocean and savanna on the water screens. 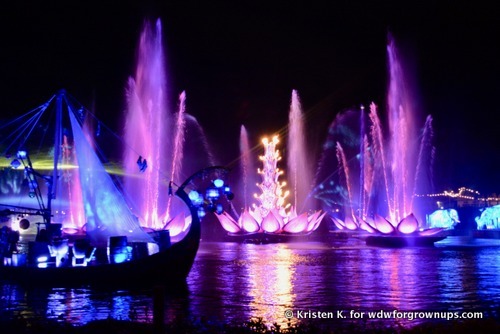 Rivers of Light is a lovely performance that features state-of-the-art projection effects, water screens, floating lanterns, music, and more. It's a solid offering that in any other location would be met with rave reviews. As far as Disney's night show goes however, it may be a little lackluster for some. I think that when a company raised the bar so high on a regular basis, expectations of anything new can be hard to live up to. Overall I was entranced by the beautiful performance. As an adult I found it to be a charming way to end the night at Animal Kingdom. 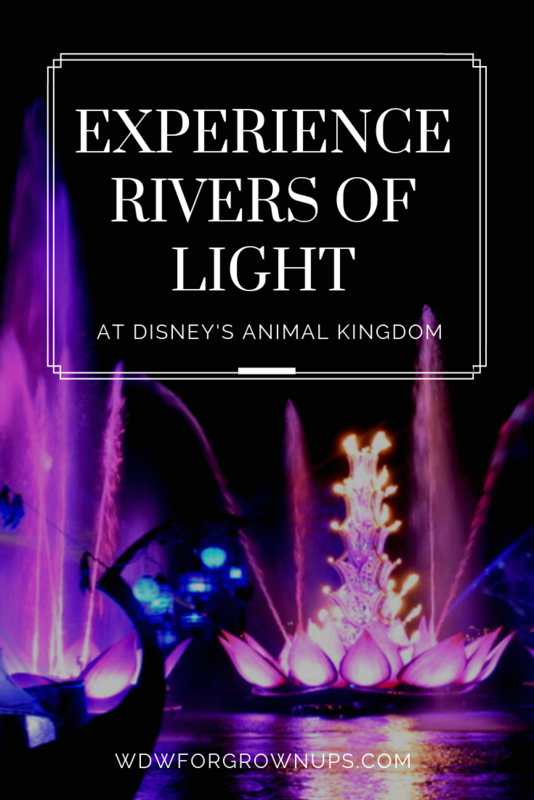 Have you seen Rivers of Light? Leave a comment and let me know what you thought! I have to say, this is one of my all-time favorite night time shows. It's not fireworks, but it captures the essence of what Animal Kingdom was designed to be.